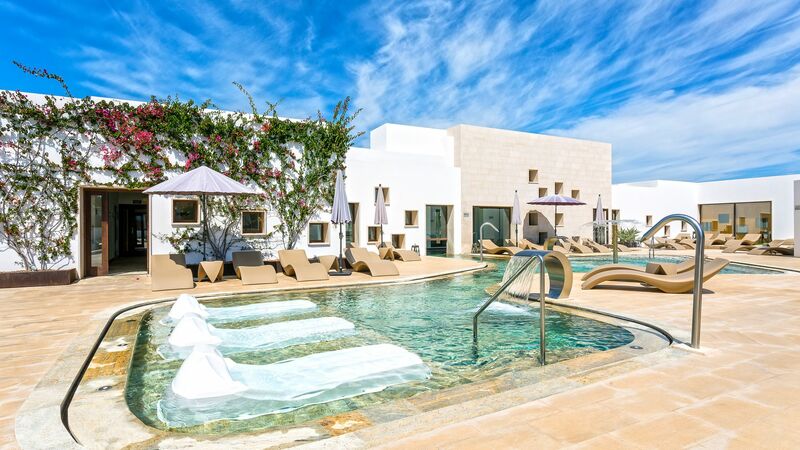 Boasting a privileged location on the beautiful sandy beach of Playa d'en Bossa, the Grand Palladium Palace Ibiza Resort provides an ideal setting for an unforgettable holiday. This large modern hotel offers spacious, well-equipped guest rooms and a wealth of amenities. Choose to dine al fresco at one of the hotel's four restaurants and enjoy well-prepared dishes and magnificent sea views. Days can be spent enjoying the many sports activities, including tennis and watersports, indulging in a treatment at the Spa & Wellness Centre or simply relaxing on one of the large Balinese beds whilst listening to the music that gently plays in the background. Families are also well catered for at this hotel, with a children's club, two children's pools and indoor and outdoor play areas. 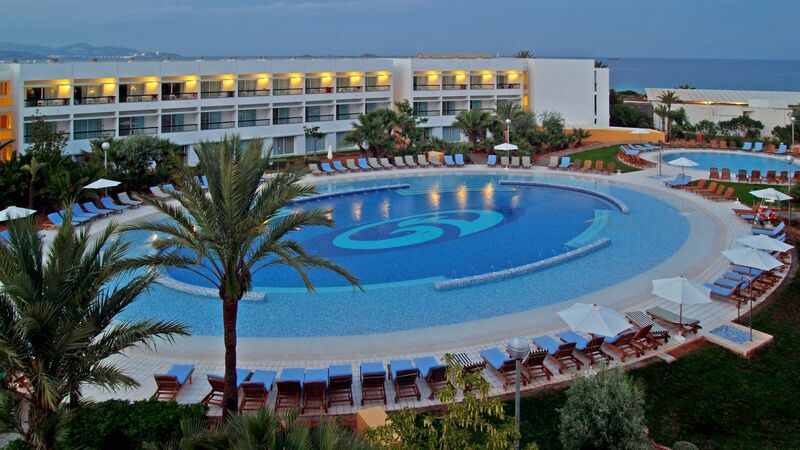 With its fantastic location just six kilometres from Ibiza Town and alongside a natural protected area, the Grand Palladium Palace Ibiza Resort promises to offer something for everyone. The hotel has 410 rooms, 2 floors and 5 lifts. Breakfast, lunch and dinner. Local and international branded alcoholic and non-alcoholic drinks. Snacks. Ice cream. 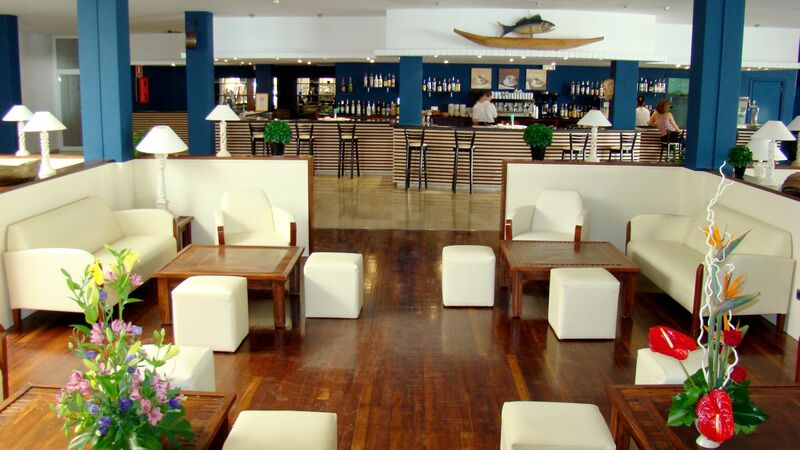 Guests are also able to use all of the facilities and dine at the Grand Palladium White Island Resort & Spa. All restaurants are available on the all inclusive programme, reservations may be required for the à la carte restaurants. 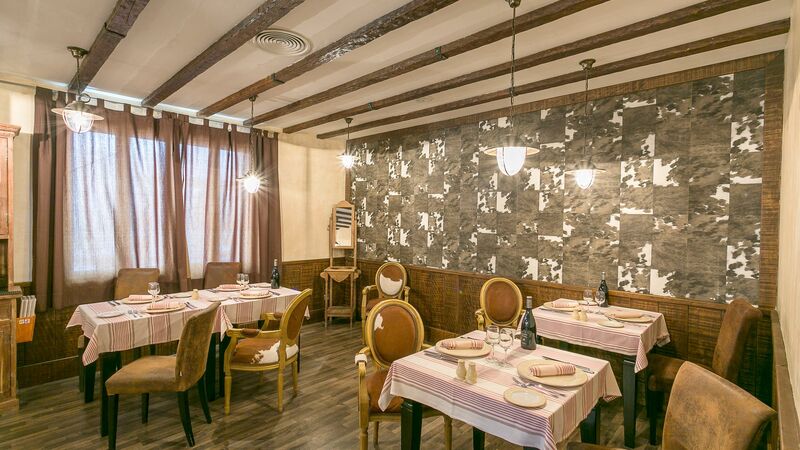 Open for dinner, serving Mediterranean dishes prepared using fresh ingredients. This restaurant also has an al fresco area. Open for dinner, this Mexican restaurant offers a variety of dishes and an al fresco area. 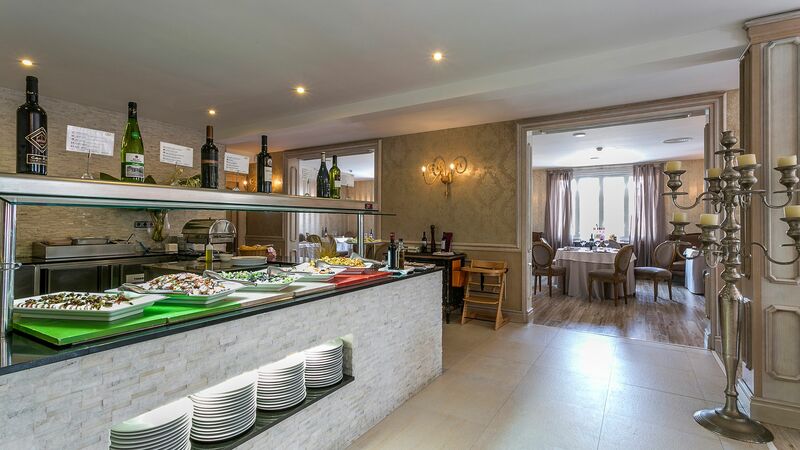 This buffet restaurant is located in the main building and offers a varied menu, show cooking and an al fresco area. 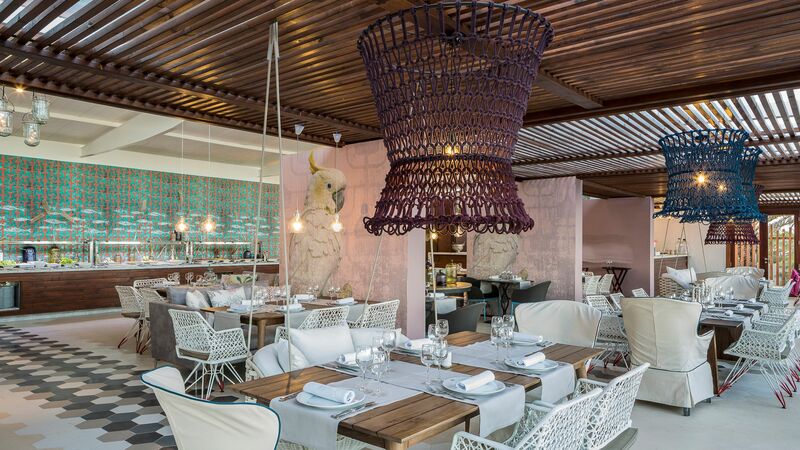 Portofino is located by the beach with magnificent sea views, and offers a selection of light dishes and snacks throughout the day and delicious meals in the evenings. The hotel boasts two bars; the Lobby Bar that offers peace and quiet and the Pool Bar that serves an array of cocktails, soft drinks and snacks. The hotel has three swimming pools, two for families and one for children. 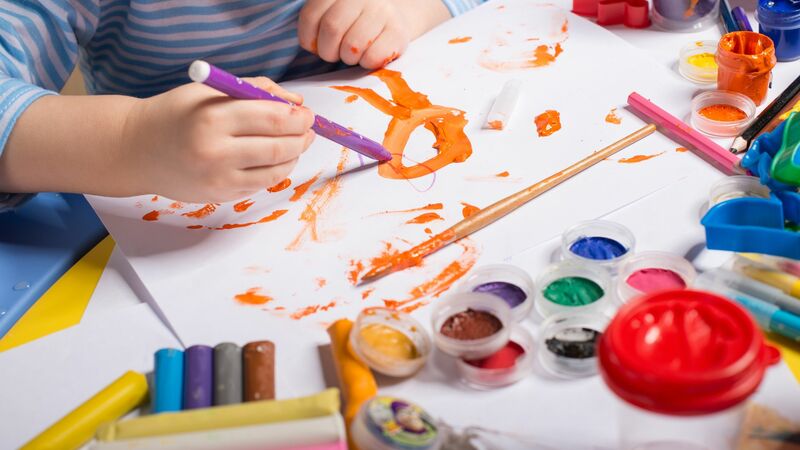 The Baby Club is available for children aged 1 - 3 years with care provided by nannies that are fully qualified and multilingual. The Mini Club is for children aged 4 - 12 years and provides lots of fun with themed days, games, competitions and educational activities. The Junior Club is for children aged 9 years and over and has a games and virtual zone, DJ classes and workshops, football, basketball and much more. Zentropía Spa offers guests a place to relax and unwind with its thermal area including an indoor and outdoor pools, Jacuzzi®, sauna and steam baths and sensation showers. A fully equipped gym and treatment rooms are also available. Guests over the age of 18 years are welcome to use the spa facilities. Charges apply. Playa d'en Bossa sits in a sun-drenched spot on Ibiza's south-east coast, around two miles outside Ibiza Town. A real crowd-pleaser, the resort's nightlife scene is an overflow from Ibiza Town, with a line-up of swanky cocktail bars and exclusive beach clubs dotted along the waterfront. But by day, Playa d'en Bossa quietens down. There's a real family focus, with a stunner of a beach wrapped around the coast - think super-soft sand, smooth shoreline and a backdrop of palm trees. It's also fully equipped with a watersports centre, beachfront playgrounds and sun loungers where you can camp out all day. The picturesque shady waterfront has a sociable buzz from a string of souvenir shops, family-friendly restaurants and pubs. Double Rooms have two twin beds or a king size bed, air conditioning, ceiling fan, satellite TV, telephone, WiFi, safe, iron & ironing board, tea & coffee making facilities, radio/iPod docking station, pillow menu, hairdryer, bathrobes, slippers and a furnished balcony or terrace. Junior Suites have a separate lounge, minibar, Jacuzzi® bath and balcony. Master Suites are the same as Junior Suites but have two bedrooms and a separate entrance hallway. Save up to 20% on the hotel price for holidays between 23 - 31 October 2019 booked by 30 April 2019. Save up to 10% on the hotel price for holidays between 22 September - 22 October 2019 booked by 30 April 2019. “ Fit and you know it!!! You know that gorgeous guy/girl standing at the bar and you go over to talk to them and realise within 10 seconds they have zero personality - Grand Palladium in a nut shell. Great looking hotel with some fab features, pools, room terraces, kids club ruined by a service level that is beyond belief. I'll start with the weather wasn't great especially the last 2 days of the week (13-20th April) but how can this be an excuse for dirty tables in the restaurant, waiting 10 minutes to get cutlery for breakfast, lunch or dinner. Waiter staff rude when asked to clean, throwing knifes and forks down as though why did we need them. Never even asked if we wanted a pot of tea (probably due to them being rushed off there feet). Reception staff at check in turning the fact me and my wife have different surnames (passport not updated) into some seedy week away with the mistress and kids. Are you for real from a supposed 5* hotel. When you went to avoid the buffet restaurant and turned to the 24/7 sports bar after an hour of waiting for food and asking numerous times will it be ready soon to get no food and then laughed at by the waitress and told to eat at the buffet restaurant. Making a 4 and 5 year old wait and then laughing at them, seriously - plain disgusting. Bar staff I feel sorry for them, rushed off there feet unable to have any fun with holiday makers and seeing people waiting up to 15 minutes to get a drink. Invest in some staff your supposed to be 5* Complaints went in to several staff (Moira i think got the brunt of one of them) who did try to help, a night at the al a carte so that avoided a dinner at the buffet but i think she knew there is something seriously wrong with staff levels, attitude and service being provided here. That bad we even ate out 2 nights, paying all inclusive to then eat out - yep that bad To finish it off when checking out asked how was our stay we said extremley dissappointed with service he just shrugged and walked off - had to get another member of staff to call a taxi for airport. Jokes!! Ive read some good reviews on here and either there is some major problems going off in the background of this hotel at the minute or people have such low expectations they class this as a good hotel. Either way the weather and being busy is not an excuse, The hotel knows its Easter break and should plan accordingly I will finish on some plus points as it does have some - Kids club, top marks to the team, had a busy week lots of kids and both ours fully enjoyed it. Good set up having kids pool, kids club/junior club / bar with snacks all within a secure area. Room was nice, bathroom a little tired with a non working bath jacuzzi but nothing too bad, recommend the extra of getting the terrace with hot tub certainly helped with the poor weather days. Cleaned to a high standard. Plenty of pools and Al a carte restaurants are nice, food is a decent although its the same there is enough choice. I just cant imagine this hotel in peak times. Would be pure choas. “ Poor weather can?? ?t stop us! Having come to Ibiza at Easter last year we thought we would try a hotel on Playa d?? ?En Bossa and stayed this year at the Grand Palladium an all inclusive hotel/ restaurants. Plenty of choice on food and you have to book 48 hours before allocation to an A La Carte restaurant which was worth the wait, we tried the Mexican restaurant and the service was superb. Local beer and wines are in the price and are drinkable and wide variety of spirits and cocktails. Don?? ?t need to go for premium drinks. Plenty of decent spirits Gordon Gin, Captain Morgan Rum, bells whisky, Aperol, Frecinet Cava etc. Rooms are modern and clean with proper double beds. Nice balconies and air conditioning. Portofino restaurant very pretty overlooking the beach. Sports bar excellent- even managed to show Derby vs QPR and bar snacks are great Overall a lovely stay despite it raining solidly most of the time here- whilst Easter heatwave in UK! Can also use facilities and bar restaurants at a white Sands hotel too. 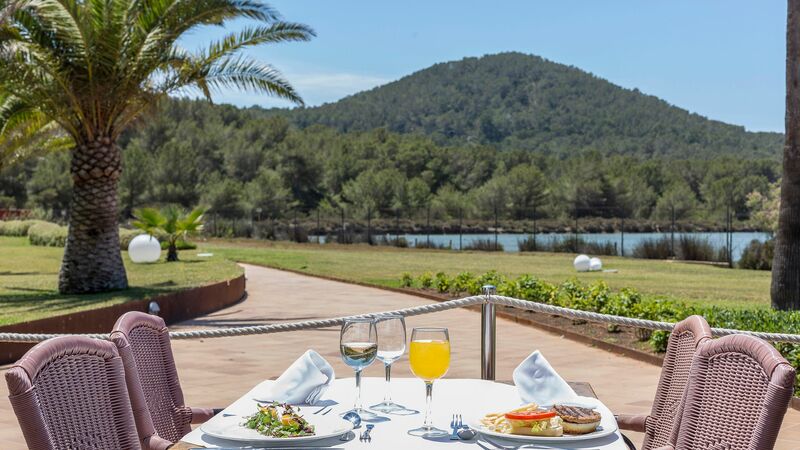 I've been to Ibiza a couple of times, and although enjoyment of the vacation for my family and me depends mostly on the season and the weather, this time the hotel's service had a huge impact on our enjoyment. The weather gods were not on our side this time, but the hotel staff was. They did this best to fulfill all our needs and make up for the bad weather. This is the best service we had in quite some time, and I'm glad I have found this hotel, as I?? ?ll definitely be staying only here from now on. Me and my family just wanna say thanks to great stuff od Palladium hotel. We love Ibiza. We expected nice weather like every year but now we had rain. Amazing thing happened, just as we were geting bored hotel organised number od activities in order to help us get fun. They were full prepared, from umbrellas to games. Thanks again for great holiday, tis not your fault that we had rain days. We had a nice stay at the Grand Palladium Palace last year, so tried again this year. Sadly, this proved a big mistake as it was overcrowded, dirty and unhygienic, feeling more like a downmarket holiday camp than a 5-star experience. And that was before the weather took a turn for the worse. On a positive note, the rooms are nice (if you get one that doesn?? ?t smell of sewage), the all-inclusive food/drink generally good (albeit variable) and staff mostly helpful. But when busy it all seems to go downhill very quickly. Restaurant reservations became nigh on impossible and the hotel?? ?s included buffet and bars became a truly lowbrow experience, overcrowded, dirty and unhygienic as mentioned by other reviewers. Disgusting for a 5-star hotel. We stayed in a Junior Suite this year and last. Plenty of room for us and the kids, who had a sofa bed in an adjoining sitting room. Beds comfortable and housekeeping good, room kept nice and clean. That said, the rooms smell ???musty?? ?, the first room we were offered had strong sewage smells coming from the bathroom (sorted with a room change) and the showers drain too slowly, so spend more than a few minutes in there and the tray overflows, flooding the bathroom since the shower door seals don?? ?t work (we experienced all three issues last year too, so suspect this is more the norm than an exception). The kid?? ?s area has very friendly and helpful staff, along with a fun mini pool, although finding a lounger difficult when sunny. Our kids dipped in and out, enjoyed themselves. Would be nice if the club opened beyond 6pm sometimes, so parents can have dinner alone (although given the difficulty in getting restaurant reservations, I guess this point is moot). The hotel is located by a lovely long sandy beach. Weather didn?? ?t lend itself to swimming during our stay (April), but imagine it?? ?s nice in the summer. Unfortunately, the positive points were far outweighed by the misery caused by overcrowding. It did not make for a relaxing holiday. I dread to think how bad it must get in peak season. I emailed the manager, Mr Segarra, during our stay to highlight the issues (notably hygiene) caused by overcrowding, but he didn?? ?t bother replying and the issues persisted. Suggests the hotel/manager just don?? ?t care about guest?? ?s comfort. We had hoped this would become one of our go to hotels for an easy European break but, based on this stay, we won?? ?t be returning. The extent our experience deteriorated from our stay the same time last year is shocking and it won?? ?t be hard to find much better alternatives. If you visit during a quiet period, you?? ?ll probably have a nice stay. But when busy the hotel feels like a glorified holiday camp that would struggle to scrape 3 stars at best. And some aspects are truly disgusting.